You’re invited to this FREE class on March 25th & 26th: The Stress-Free Financial Blueprint: A 5-step plan for creating an awesome, worry-free future for you and your family, hosted by Lauren Greutman. Register now! Recently during our live morning show every Tuesday and Thursday, we started talking about budgeting. 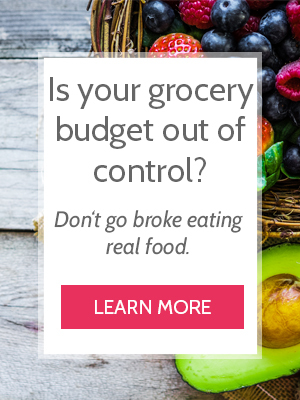 I shared how my family’s grocery budget has changed over the years – from $25/week when we first started out, to $200/week during the nightmare season from hell. Budgeting and having a financial plan changed our lives. It kept us alive and independent when we were broke. It kept us afloat when everything hit the fan, and it eventually helped us purchase our first home with cash. That’s why I wanted to tell you about a free class called The Stress-Free Financial Blueprint: A 5-step plan for creating an awesome, worry-free future for you and your family. Lauren is sharing her practical tips and experience in this FREE class on March 25th or March 26th. Just pick your time and register for the free webinar here. Having a solid financial plan will change your life. I’m living proof. If you are struggling right now or just need a tune-up, check out this class!